Sometimes, you don’t have to go very far to get away from it all. Car camping is an easy way to get out into nature, and you don’t need any special skills to do it. Here are our best car camping tips for beginners. It’s cheap. Here in Virginia, a state park campsite usually costs around $20-$30 per night. You can choose your comfort level. Developed campgrounds may have everything: water, electric outlets, toilets, showers, a camp store and a laundromat. Primitive campsites usually have fire grills, picnic tables and pit toilets. You can bring as much stuff as you want. A cooler of cold drinks. A few bottles of wine. Party lights and a tablecloth. Camp chairs. The only limit is the size of your car. It’s perfect for kids. For kids, car camping is the next step up from pitching a tent in the backyard. You have an escape route. If a drenching storm rolls in, or if it’s way, way too hot to sleep, you can throw everything in the car and check into a nearby hotel. Book your campsite well in advance. While it’s tempting to wait until Thursday to book a campsite for a sunny weekend, popular campgrounds fill up quickly. Sunday nights are usually a good time to go, as well as weekdays. Location matters. Sometimes you can reserve a specific campsite, and sometimes it’s first come, first serve. Either way, choose your site carefully. If you have small children, you may want to pick a site that’s close to the bathrooms. And if you see twelve frat brothers setting up tents at the group campsite, head far, far away. Light the night. In your everyday life, the sunset’s just something you notice through the window. When you’re car camping, nightfall means you suddenly can’t see. Get your tent set up and food preparation done before the sun sets, and bring plenty of flashlights, lanterns and headlamps. Respect wildlife. While you’re not exactly in the wilderness, you’re likely to encounter some wild animals while car camping. Don’t feed them. Not even if you want to Instagram a selfie with a deer. Instead, store all food in your car or in animal-proof containers, away from your tent — unless you want a 3 a.m. wakeup call from a raccoon. Beware of bugs. If you’re car camping spring through fall, defend yourself well against insects. Bring insect repellent. 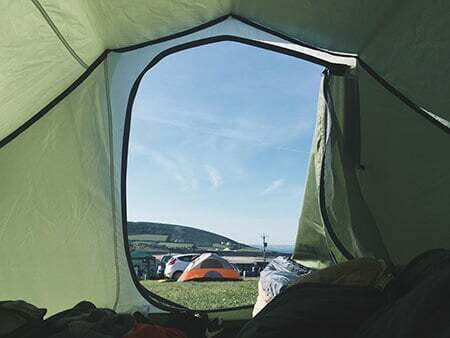 Always keep your tent door zipped to prevent mosquitoes from entering. On the East Coast, Lyme disease-carrying deer ticks are a serious threat. Wear long pants, treat shoes and socks with permethrin, spray repellent on your clothes and your tent floor, make sure dogs are treated with tick medication, and check yourself frequently for ticks. A sleeping bag is not enough. One thing you’ll learn while car camping is that the ground is hard. And pinecones are pointy. To get a good night’s sleep, clear your campsite of any sharp objects, then put down a tarp under the tent. Inside, you’ll want foam or inflatable sleeping pads plus sleeping bags and blankets. Pack thoughtfully. We love bringing a small, battery-powered fan for the tent; not only does it cool you in the summer, but the noise can lull you to sleep. Cloth dishtowels always come in handy. Books and games are great for quiet nights and rainy days. Respect the campground. You can play music, but don’t blast it. You can drink, but don’t get wasted. If you break camp rules, you’ll annoy your neighbors and you might get kicked out. Leave devices in the car. The whole point of car camping is to get away from your regular life for a day or two. Do your best to disconnect. Plus, there’s plenty of time to post when you get back. If you discover you love car camping, maybe it’s time to up your game with a rugged vehicle. Here are six of the best cars for adventure.